The School of Integrative Plant Science and CALS Viticulture & Enology program are pleased to welcome Russell Moss, lecturer in viticulture. Moss’s responsibilities at Cornell will include the co-teaching of two existing courses in Viticulture & Enology, development of vineyard practicums for upper-level and graduate V&E students, and mentorship of undergraduates and MPS students. 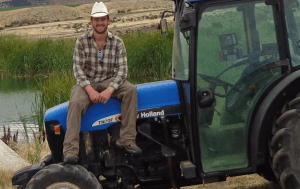 Moss previously served Oregon’s Willamette Valley as the viticulture instructor at Chemeketa Community College and represented a large grapevine nursery based in California. Moss was also the viticulturist for Oregon’s preeminent luxury wine brand, Domaine Serene and Chateau de la Cree in Burgundy, France. He has also managed vineyards and made wine in New Zealand and California. Moss holds a masters of science in horticulture (viticulture) and a masters of life sciences in food science and technology (enology) from Virginia Tech and a bachelors of viticulture and enology from Lincoln University in New Zealand. His technical works on grapes and wine have been published in Australia, New Zealand, The United States, and South Africa, and he serves on various grape and wine industry committees throughout the US in addition to being a member of the American Society for Enology and Viticulture. When not fully immersed in grapes and wines, Moss enjoys playing the trombone and traveling. The Viticulture & Enology major was established by CALS in 2008 to address the needs of the rapidly growing Eastern and Midwestern grape and wine industries, including the approximately 350 wineries in New York. The program has recently had ~ 30 undergraduates in the major, another 30 completing the minor, and provides instruction to over 600 students per year across a range of survey and specialized courses.